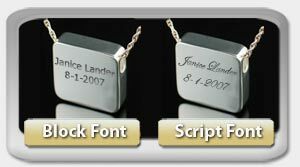 Engraving is Available with this Keepsake. You may select Block or Script font. This exceptional silver plated Timeless keychain funeral jewelry is a great way to display your continued devotion and faith in memory of someone no longer with you. Each silver plated Timeless keychain has been crafted of silver plated over brass and the unique design makes it eye catching and appealing to men and women alike. Size 3/4"w x 1"h.
I purchased this for my husband to carry around some of the ashes of our beautiful little dog, Cassie. He loves and charishes it.